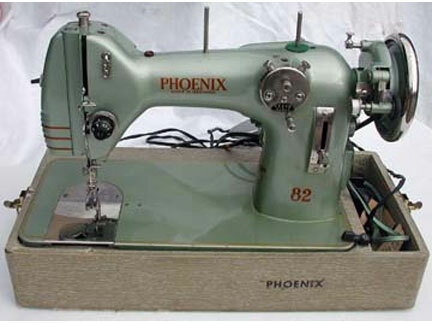 Baer & Rempel Sewing Machine Company made this Phoenix Class 82 machine probably in 1948 according to www.needlebar.com. We found it in TN. We don't have a manual and know nothing about its pedigree. Access to the bobbin and bobbin case is behind this vault door. The door is opened by releasing a metal latch then lowering the door. 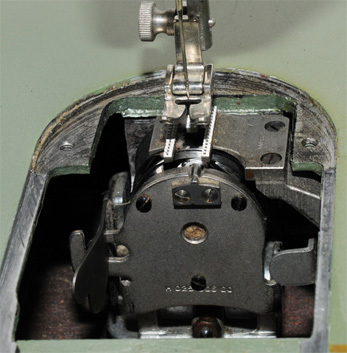 The bobbin and case appear to be easier to insert if laid in the door and then close the door rather than try to fit it into its compartment then close the vault door. Feed dogs are lowered by moving a control on the right-hand side of the slide plate opening. 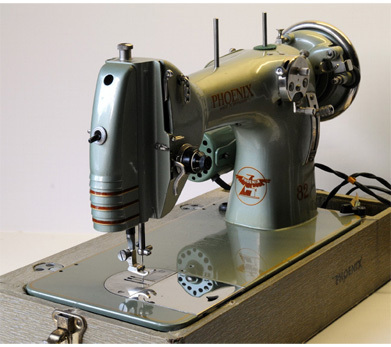 If the bobbin case and bobbin do not come with the machine, we would suspect difficulty in locating a replacement. We were fortunate have this bobbin case and two bobbins. The bobbin is 9 mm thick and 21 mm diameter. The image above shows the excellent condition of our Phoenix. It also has a nice presser foot and ample feed dog arrangement for straight stitch sewing. 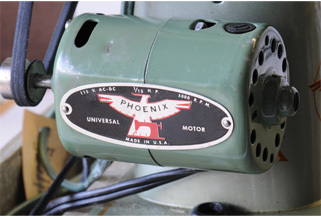 While the Phoenix 82 sewing machine is made in Germany, the Phoenix motor appears to have been made in the U.S.A. The motor emitted a bit of smoke when we first fired up the machine and we are currently addressing that problem. The Phoenix 82 has zig-zag capabilities. 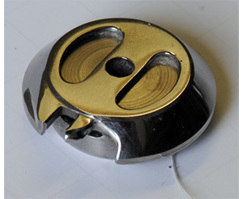 Stitch width is selected using a knob on the bottom of the circular piece. 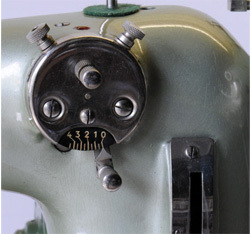 The knobs in the 10 and 2 o'clock positions can be set to limit zig-zag stitch width. 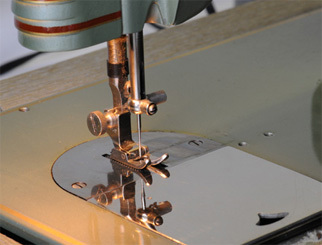 Reverse sewing is achieved by raising the slider shown on the lower right of the above image.